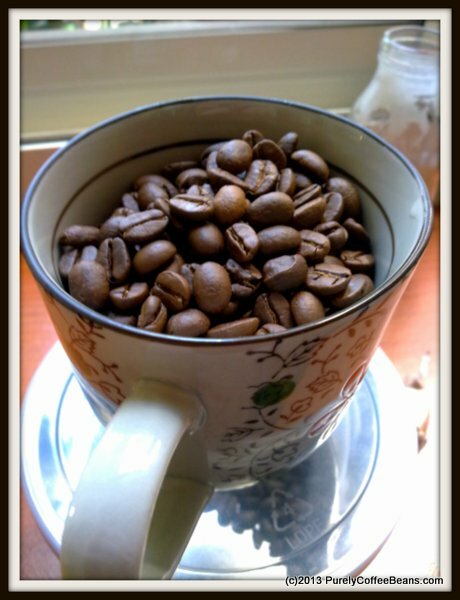 Home » Types of Coffee Beans » Indian Coffee: Have you ever tasted coffee from India? It’s a whole new bean! Indian Coffee: Have you ever tasted coffee from India? It’s a whole new bean! Ever had a cup of Indian coffee? It’s not likely that you have. 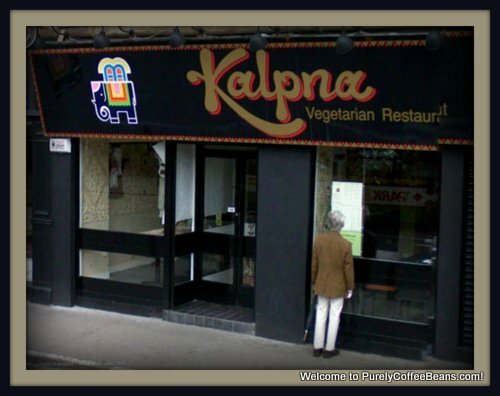 But I have … when I worked in a top UK Indian restaurant (Kalpna’s in Edinburgh: pictured). I got the chance to try my first cups of Indian Mysore coffee , and found it absolutely delicious: much more like a darkly roasted espresso-type coffee. This article introduces some of the coffee growing regions of India, highlights an interview with a senior director of the Coffee Board of India. 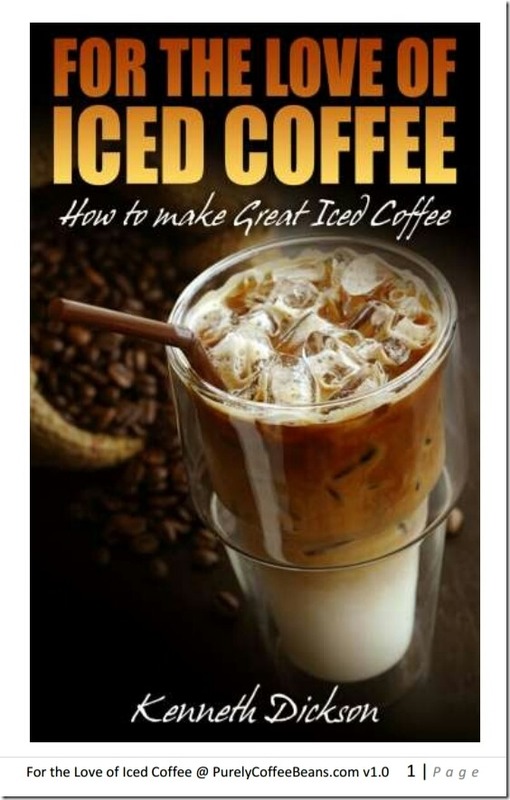 You’ll also find out the different varieties of coffee beans that you can look for, and a couple of masterful coffee recipe variations that the Indians love to make and drink. I was privileged to meet Mr. Annapurnaiah Kolluri, Joint Director of the Coffee Board of India, at a November 2012 coffee expo in Taipei City, Taiwan, where he was enthusiastically promoting Indian coffee (pictured) to both buyers and consumers. Stay tuned to find out what he had to say and why Indian Coffee is increasingly popular, not just in India…! Read the interview below. But first of all, we’ll introduce you to Baba Budan… Even now, most people think of tea when India is mentioned but the country has grown coffee since the 17th century. It is said that the Indian saint Baba Budan discovered coffee when he made a pilgrimage to Mecca and traveled through Yemen. He smuggled seven coffee beans out of the country in his clothing and when he returned home, he planted the green coffee beans in the hills of Chikkamagaluru, in present day Mysore State, which has since been renamed Baba Budan Hills in recognition for this saint. Coffee from India is said to have the best shade grown coffee in the world with full body and intoxicating aroma. A unique double-tiered canopy that allows a mixed shade environment is used combining evergreen trees and around fifty types of shade trees. Indian coffee tends to be mild and well balanced with low acidity and spicy notes. You’ll sometimes detect hints on earthiness similar to Sumatran coffee. The ground beans have a nutty scent with a sweet toffee undertone. When wet, the ground coffee emits a nutty aroma with hints of pecan and honey. You’ll notice the coffee is almost syrupy and has brightness with a slightly rustic finish. There are four main varieties of coffee grown in India. Kents was introduced by an English planter of that name in the early 1920’s. It was very popular for about two decades and is still grown in a few areas; it’s known for its exceptional flavor and cup quality. Selection 795 is a favorite with planters and is known for his high quality; it is balanced and has subtle notes of Mocca. Cauvery, also called Catimor, is mutated from the Bourbon variety. Selection 9 is a mixture of Ethiopian coffees and has superior taste and body; it won the Fine Cup Award from the Coffee Board of India for best Arabica in 2002. 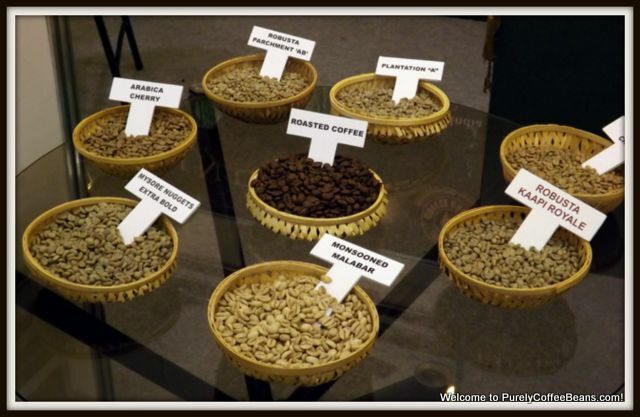 There are also specialty coffees from individual plantations. For instance, Amrita (nectar of the gods) coffee is unique in that the beans dry in the fruit on the coffee bush before they are picked. It’s said that this coffee is the most natural you will find anywhere. If you want a special Indian coffee treat you should try Monsooned Malabar coffee. After harvesting and processing, the beans are stored until the monsoon season from June through September. The beans are then left to the strong, moist monsoon winds which causes the beans to absorb moisture and swell in size. Their acidity level is thereby reduced. The beans must be repeatedly raked and turned at regular intervals and when the process is done they have taken on a pale golden color. This process is perfect for those who like deep, strong and musty flavor in their coffee and yet the brew is sweet and syrupy. Coffee in the southern part of India is grown in Karnataka, Kerala and Tamil Nadu. In the east it is grown in Andhra Pradesh and Orissa; in the northeastern regions there are plantations in the Seven Sister states including Assam which produces some of the best tea in the world. The southern plantations are the oldest growers while the Eastern Ghats and northeastern states have developed their coffee plantations relatively recently. Welcome to our series of interviews with coffee experts. 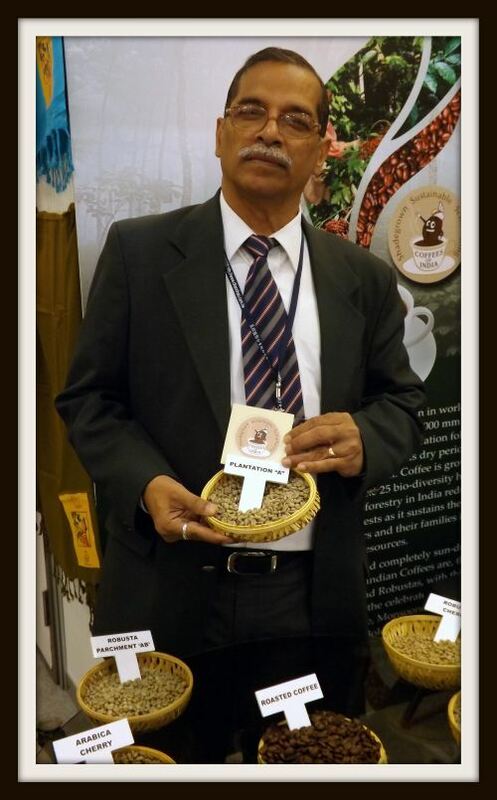 This is the first of the planned series, in which I was privileged to meet Mr. Annapurnaiah Kolluri, Joint Director of the Coffee Board of India, at a November 2012 coffee expo in Taipei City, Taiwan, where he was enthusiastically promoting Indian coffee (pictured) to both buyers and consumers. He kindly agreed to do an email interview to share his passion for Indian coffee, his zeal to promote new coffee growers, and his enthusiasm for bringing new production methods and new markets to India’s coffee growers. This interview was carried out recently in mid-December 2012. Could you introduce yourself to the readers of PurelyCoffeeBeans.com? I work in the Coffee Board of India which is an autonomous organization under the Indian Ministry of Commerce and Industry. Ever since I joined the Coffee Board in 1978, 34 years ago, I have served in various capacities and spheres of work like Planning, Projects, Monitoring & Evaluation, Development Finance, coordinating Extension and Development finance support services. Presently, I occupy a senior executive post in the Coffee Board, exercising control over the jurisdiction of two major coffee growing states: Kerala (2nd Ranked Coffee Growing State) and Tamil Nadu (3rd Ranked) both located in the southern part of India. Early morning just after getting up, I love traditionally brewed coffee in a stainless steel coffee filter. I prefer the same coffee along with breakfast. In the office we drink a freshly brewed plantation blend (Arabica Parchment dominating with Robusta adding the required body) and for the evening snack it is a cappuccino. We end the night with a dash of espresso sitting at one of the cafes like Starbucks, Cafe Coffee Day, Barista etc. How did you get involved in your current position? I graduated with a Bachelor of Science degree in Agriculture and later did my Management Studies (MBA) from a reputed institute in India before joining the Coffee Board. By virtue of my 3 decades of experience working in many departments of the Coffee Board, I happen to get involved with many international assignments. I have represented India at many important International Expos, held in countries such as Italy, Japan, New Zealand, Taiwan, Vietnam, Indonesia, Nicaragua, etc. during the last 12 years. What makes Indian coffee different, in your opinion, from its South American or Vietnamese counterparts? Compared to the coffees originating from South America, Indian coffee gets classified as ‘Other Milds’ due to its mild flavor and acidic nature. It is preferred all over the world as a ‘blend’ with other coffees to enhance the overall coffee quality. Whereas Vietnam produces mainly Robusta coffee, Indian Robustas are found to be more natural due to the better climatic and soil factors in India. At the same time, Indian coffee growing is more eco-friendly and sustainable on account of the 2- tier shade system, the presence of varied wildlife, such as elephants, wild boars, tigers, monkeys, etc., and the rich fauna and flora native to India. How has Indian coffee growing changed in the last 20 years? During the last 20 years the Indian coffee farmers have begun to perceive some of the challenges facing themselves as opportunities and started producing geographic specific or estate specific specialty coffees in good volume, both of which have tasted success in global markets. Today Indian coffees are finding their way into niche markets, as well as entering new and emerging markets like China, Taiwan etc..
What trends are becoming important to coffee growers? And to coffee consumers? To produce globally accepted specialty coffee as well as sustainable coffee is increasingly important to coffee growers, instead of just being content to satisfy domestic consumers. The coffee consumers in India have also learned to match global consumers’ trends as we notice their shift in tastes for gourmet coffee and patronizing the cafes we now see springing up in our culture. This is more noticeable when you look at the next generation of coffee consumers as the country’s population is still growing and more people are spending more disposable income. How do you think the entry of players like Starbucks into the Indian market will change the perceptions towards Indian coffee in the next few years? My perception about Starbucks is that they are capable of increasing domestic consumption in the country by many folds due to their ability to project coffee as a beverage vital to people’s daily routine. Their successful marketing to younger consumers comes with the help of brand ambassadors and appropriate large scale promotion campaigns. The Indian coffee farmers too tend to fine tune their products to match the requirements of Starbucks. What is the biggest challenge you face in your work? And the biggest reward? To make the Indian coffee growers produce eco-friendly, sustainable and specialty coffees. The biggest reward I have been getting is witnessing the ever increasing exports of Indian specialties in the last few years and the exciting trend in this direction. Both coffee and tea are important economically and culturally to India. If you had to choose which one would you take on a trip to moon? Of course! I would like to carry ‘Monsoon Malabar’ coffee which is produced only in India during my trip to the Moon. Thank you for taking the time to answer our questions in this interview for PurelyCoffeeBeans.com. Managed by the Ministry of Commerce & Industry, the Coffee Board was tasked to promote coffee production in India. Now its duties include promotion, consumption, and sale of coffee. It also carries out an active research program, provides financial assistance to coffee growers, and works actively to increase both coffee production and productivity. You can find out more about the Coffee Board by clicking to read about Indian Coffee or visiting www.indiacoffee.org. In this video, the Indian Board of Coffee shows how coffee is made in India. Some of the methods you will recognize! The presenter introduces how to prepare your favorite drink, though you will see one unique piece of coffee kit: The Stainless steel filter. That is perhaps the most interesting aspect of the video, as the presenter shows how it is used. One interesting variation in India is the Indian filter coffee which is combined with 20% chicory to aid brewing. Then a couple of tablespoons are added to hot milk with sugar for serving. You can find some real Indian brands of coffee in the Amazon store. See what’s available.